Premier League: How are teams doing compared with same fixtures last season? Tottenham have improved this season, Manchester United have gone backwards. With six games gone in the Premier League, data analysts Gracenote have assessed every team's start to the campaign - and the findings make for interesting reading. With three straight defeats leading to talk of a "mini-crisis" at Tottenham and some bizarre comments from manager Mauricio Pochettino, you would be forgiven for thinking Tottenham had endured a poor start to the season. But a look in detail at their results so far shows they are actually three points better off than they were from the corresponding fixtures last season, as well as having one point more than they did after six matches in 2017-18. 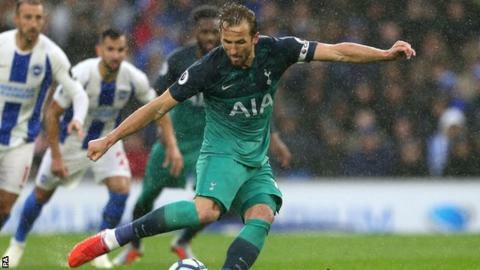 So despite their stadium not being ready yet, questions over Harry Kane's fitness and the worst run of results since Mauricio Pochettino took charge in 2014, perhaps it is time for a little perspective. Manchester United - it's good but is it good enough? Winless Newcastle aside, Manchester United have endured the biggest drop-off of any Premier League team when it comes to comparing this season's results with 2017-18. They have steadied the ship in recent weeks with two consecutive away wins, plus one on the road in the Champions League. They are seventh in the league and within touching distance of the top four. And if you look at manager Jose Mourinho's face you can see a slight upturn in that frown. But United have taken five fewer points this term than from the same games last season, and they also have six points fewer overall than they did after six matches 12 months ago. Given that they finished 19 points behind champions Manchester City last season, that downturn might be a little alarming. In strolling to the title last season, Manchester City set a record by becoming the first team in English top-flight history to reach 100 points. It was one of a series of landmarks achieved by Pep Guardola's side, but one that attacker Kevin de Bruyne said would be "probably impossible" to repeat. But so far, so good for City, who are on course to replicate last season's tally. They have 16 points from six games, exactly the same as they had at this stage during the last campaign. And what about the corresponding fixtures comparison? For the sake of this table we are substituting relegated Swansea for promoted Wolves, which means that City also managed 16 points from those same fixtures last season. They are the only side in the table to have neither improved nor performed worse. Consistently brilliant. Many Arsenal fans were relentlessly vocal in their calls for Arsene Wenger to leave the club last season, so has the change in manager made a difference so far? It is perhaps too early to judge Emery, but the statistics do indicate the Gunners have improved following Wenger's departure. Arsenal are two points better off than this time last year and have earned five more points in the corresponding fixtures (Stoke have been replaced by Cardiff for comparison purposes). The Gunners lost at Newcastle and the Potters last season. Chelsea and Watford have made splendid starts and got the better of opponents they struggled against last campaign. But it is the points improvements of Liverpool and Crystal Palace which are the most striking among the best of the rest. The Eagles had a shocking start to the 2017-18 season, losing their first seven games and failing to score in 731 minutes. Fast forward to September 2018 and they sit comfortably in mid-table with seven points, and have earned (more modestly, admittedly) one more point than they gained from last season's six corresponding fixtures. Are Liverpool the team likeliest to challenge champions City for the title? They currently have the league's only 100% record, and are seven points better off than at this stage last season. Two draws against Watford and Burnley and a heavy defeat at Etihad Stadium meant they trailed City by five points after only six games in 2017-18. It is a very different story this season - but how long can Jurgen Klopp's men maintain this run? Note: When comparing promoted teams, Fulham's results have been substituted for West Brom's in 2017-18, Cardiff's for Stoke's and Wolves' for Swansea's.